Take Action | Human Rights First Tell Senators Levin and McCain: We have the tools that we need to fight terrorism! Tell Senators Levin and McCain: We have the tools that we need to fight terrorism! Great news! U.S. Senate Majority Leader Harry Reid vowed to block the controversial defense authorization bill because it calls for indefinite military detention in the United States. Congress should focus on strengthening established and effective counterterrorism tools, rather than forcing the military to take on law enforcement functions and keeping Guantanamo open as a permanent fixture of second-class justice. Now, the defense authorization bill is going back to Senators Levin and McCain, chair and ranking member of the Senate Armed Services Committee respectively, for reconsideration. 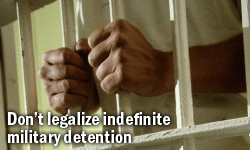 Urge Senators Levin and McCain to strip the defense authorization bill of language that calls for indefinite military detention!